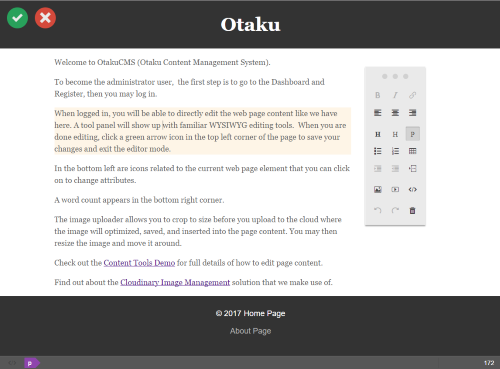 Installing OtakuCMS is very simple since the installer is built into one single file that acts as a home page, presenting an installation wizard. You view the Wizard in your web browser, fill in the details of your website (such as the Dashboard folder name) or just accept the suggested default settings and press the Install button. Then everything is set up automatically. If all goes well, you see a success page and may then press a Go to Website button to view the Home Page. The Home Page will have a link to the Dashboard where you go to Register your login details and then administer your site. The Dashboard is quite minimalist with easy to learn operations. Pages are easy to arrange in the order that they appear in menus (by drag and drop), and in parent-child relationships (via arrows). Creating a new page is as simple as clicking on a Plus Icon and then editing the Meta Data for the page such as it's Title and selecting a Template from what is available with the current theme. Image management is done in the Cloud using State of the Art technology powered by Cloudinary. So we don't foolishly try to re-invent the tricky puzzle wheel of Image Upload, optimised file delivery, and Asset Management with an inferior solution that has already been solved by a big team of experts already. Rather, we leverage these game-changing technologies! Also, we do away with the usual horrible experience of the Dashboard WYSIWYG content editor and the ugly code that it produces . Now you are able to directly edit regions of content within your web pages, immediately seeing how your edits will impact your visitors. 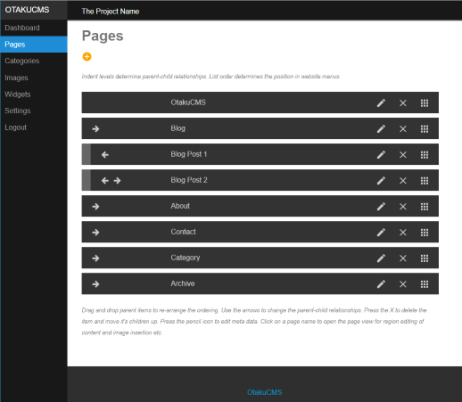 A floating widget tool panel provides the typical editor tools that you (the logged-in user) expects to have available. PHP is available with every web hosting provider that I ever found. It is easy to code with, create plugins, and modify templates. The backend code has had a lot of thought put into how to make it simple, efficient, and secure. Also, it is largely self-documenting. There is no annoying Database to set up. All data is stored in files in human-readable JSON format. So developers may directly edit the data if they so wish. The Front-end code uses the VueJS single-page App framework and communicates to the Backend via AJAX. Security is enhanced on the server by gate-keeping the allowed Classes and Method calls that are accepted from a client that is not logged in as a user.